ChungLi Toastmasters was established in August 1 , 1993. We are sixteen years old. > < We are nineteenth TM in Taiwan. What happened on March 26, our regular meeting? Let's see..
First of all , in order to have a successful meeting. We have two helper. 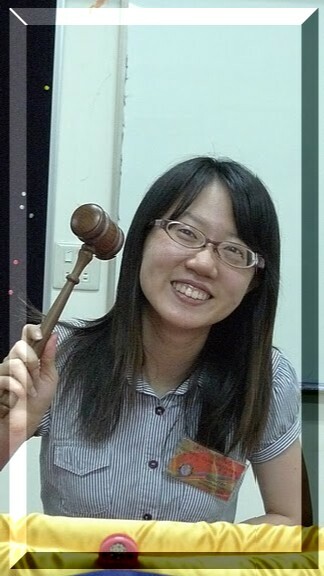 That are Timer~Eunice and Ah-Counter~who is also the 親善大使 of 中原 university-Emily to help us. The life and soul of the meeting was the prepared speech champion of In-House Contest-Albert. In-house Contest. You must be try it. In-house Contest ...You must be try it. If you are Toastmasters, you'll definitely agree with me. Aren't you? The first meeting in 2010 was in a freezing night wihch conducted by the most outstanding TM- Louis Fu (可聽過加拿大最著名的露易斯湖?) Have you ever seen the movie "2012" ? You had better prepare more speaches for delivery due to we still have 2 years to live. (Louis 如是說...博君一笑).